(Kansas City, Mo. – Nov. 14, 2014) The Kansas City Area Transportation Authority (KCATA) is preparing for the coming storm that may affect travel this weekend. 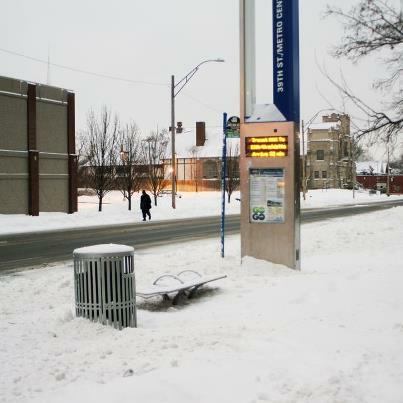 KCATA will be providing bus service and encourages its customers to plan for the weather. Those traveling tomorrow should dress warmly and be prepared for possible delays. Customers can prepare now if they need to travel. The Metro’s website, http://www.kcata.org, explains the Snow Plan. This plan pinpoints several areas that experience difficult travel in snowy weather. KCATA will issue an alert to the media and post a notice on its website if the snow reroutes are being used. The Metro offers real-time bus information through WebWatch. Customers can find their individual routes and see where buses are on a real-time map at http://www.kcata.org/maps_schedules/webwatch/. A mobile version from a third-party software designer is available at http://itsab.us/tracker/. KCATA also distributes notices about system-wide delays through the website Twitter. Customers can follow The Metro at http://www.twitter.com/KCATAMetro. KCATA road crews will treat problem spots along Metro bus routes and at bus stops.